This rattlesnake is usually 18 - 39" long. 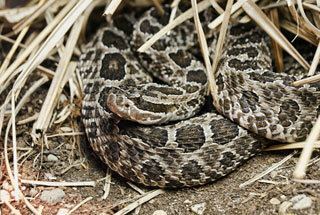 Unlike other rattlers, it has 9 enlarged scales on top of its head. It ranges from northwest Pennsylvania west to eastern Iowa and southwest into Texas. Its habitat ranges from dry woodlands to rocky hillsides to bogs and swamps. Massasauga means "great river mouth" in the Chippewa language and probably alludes to the snake's habitat in Chippewa country - swampland surrounding mouths of rivers. It may be encountered sunning on mild days; becomes crepuscular or nocturnal during hot summer months. It eats lizards, small rodents, and frogs. Unlike other rattlers, has 9 enlarged scales on top of head. Tail stocky with moderately developed rattle. Rounded dark blotches on back and sides; interspaces narrow. Light-bordered dark bar extends from eye to rear of jaw. Dark bars (often lyre-shaped) on top of head extend onto neck.